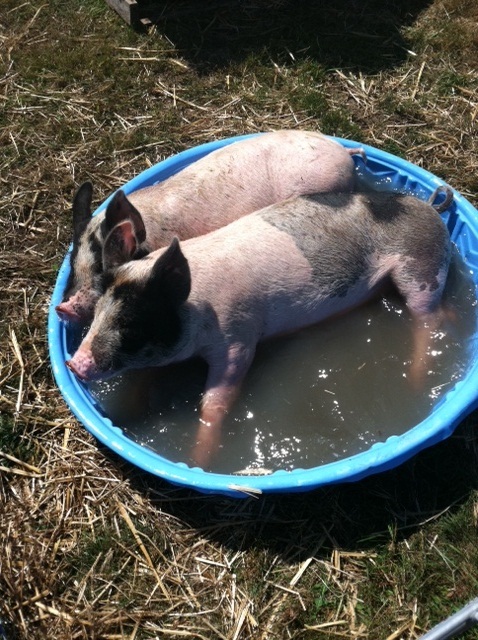 Pigs used to be raised almost entirely in the great outdoors. They are energetic, playful animals that love to run, root, and explore over a large area if allowed to do so. Unfortunately things have shifted in this country so that roughly 97% of hogs are now raised concentrated animal feedlot operations (CAFO’s) where thousands of animals are packed into warehouses with slatted metal floors where they will never have an opportunity to run or see the light of day. Furthermore, this industrial approach degrades rural communities and is frequently a source of environmental pollution. We aim in a different direction. Our pigs live on open pasture with portable shelters that allow them to stay dry and happy on rainy days. Their pens, which provide ample room for movement and playing, are moved regularly to ensure that the they stay clean and healthy and always have access to fresh forage. In addition to what they root up themselves, we provide our pigs with a GMO-free grain mix from Conway Feed and lots of fresh veggies from our fields. This low stress lifestyle, combined with a diverse, healthy diet makes for exceptionally rich, flavorful and nutritious pork. Our pigs finish in late October and are available by the half or whole. For more information on ordering pigs, follow the link below to view our 2018 order form.